As headsets go this is one of the better production versions of a headset that has everything, and everything done right in its manufacture. 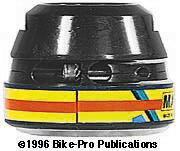 It is available as a Road Racing or Mountain Bike headset. The fork crown race, is made of stainless steel and precision ground to fit the bearings. The lower cup race is made of beautifully forged and polished aluminum, with a mated stainless steel bearing race pressed into it and the entire cup unit has an expertly crafted plastic seal that runs around the entire cup. The upper headset cone race is cast and polished aluminum with a stainless steel race that is precision ground pressed into it. 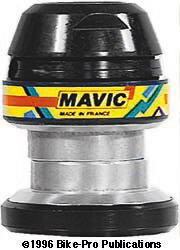 It is in the upper cup race where the Mavic headset really shows itself. It is initially forged, then machined in several ways to develop a single unit that has the cup, race, a headset locking device, o-ring seal, and special features to reduce the need of tools. This single upper cup has a precision ground stainless steel race pressed into it, is threaded for the fork (threads extend three or four times farther than most), there is an o-ring seal where the stem passes through the top cup on it's way to the fork. On the upper piece are two lateral cuts that extend half way into it, in a sense creating a slice of threaded aluminum. At one side the slice is drilled to separate that end. This piece which is now slightly loose is threaded from the end. A second thread pattern is made through the larger piece into the smaller slice. As the 2.5mm bolt is tightened, it constricts the "slice" piece around the steerer tube on the fork, holding the upper cup/head lock rigidly in place. There is a tight rubber seal (screw cover) that recesses into the sliced area and keeps contaminants out. This is really well designed. The bearing retainers are made of light weight plastic with twenty-two small steel balls pitched at an angle, so they don't interfere with each other and more could be fit into the retainer. The headset comes with the 2.5mm allen wrench. Not cheap, but well worth the difference. The Mavic Road Racing model headset is known as the 305, it's weight is 116 grams. The Mountain Bike version of the Mavic headset is known as the 315 in the 1", 316 in the 1 1/8" size and the 317 in the 1 1/4" size. The weight is of the Mavic 315 is 122.5 grams. The 305 is only with an all Silver finish. The 315, 316, and 317 are available in a Silver.